As we head into the hustle and bustle of the holiday season, I’m throwing a wrench into our little Christmas process here. Many of you know that we moved into a new home last winter and we’re finally ready to host our housewarming party! Well, we’re almost at the point where we’re ready…but the invitations went out weeks ago so now we’re committed to a date in just less than two weeks from now. This translates into a life of to-do lists, multiple trips to the hardware store, and lots of making nice after ruffled nerves give way to sharp tongues. You get my point. It also means menu planning (my favorite part, naturally) and even though I’ve been planning this party in my head for over a year, you’d think I’d have a better handle on the menu than I currently do. For reals guys – this menu has been in the works since before this house had windows! I’m still constantly adding and removing ideas but after a bout of insomnia baking hit me over the weekend and these cheddar swirl buns emerged from my oven after multiple proofs during the wee hours, I’m totally and completely sold on them being a part of our housewarming menu. Soft and buttery dough envelops swirls of sharp cheddar cheese, grated onion and thyme and I still can’t stop thinking about them. The onion melts away leaving a little tang behind and the only thing that could make these buns any better, if it’s possible, is maybe a little bacon. These buns will make breakfast or brunch, cocktail hour, or dinnertime a magical event. And surprisingly, they reheat beautifully wrapped in some foil in a 250 degree oven…so you don’t have to stand over the counter looking down at a dozen freshly baked cheese-oozing buns and fret that you might have to eat them all in one day. Like me. They are unexpectedly and decadently rich savory buns so they’ll be great for a crowd (say, at Thanksgiving) or you can just reheat them over the course of a few days. We’re not complaining. Give yourself some time to make this recipe; the inactive time for proofing is up to 4 hours total. Are they totally worth the wait? Absolutely. Is it feasible to start them in the morning to serve for breakfast? Likely not. But you can prep the dough up to the first rise and keep it in the fridge for up to 3 days before proceeding with the recipe. It's a great time saver that I'll definitely take advantage of for party prep or weekend guests. To make the dough: In the bowl of a stand mixer, combine the flour, salt, black pepper, and sugar; stir together on low speed with the paddle attachment. In a 1 cup liquid measuring cup, whisk the yeast into the warmed milk until it dissolves then pour the milk mixture and the melted butter over the dry ingredients. Mix everything together on low speed until they form a shaggy mass of dough. Switch to the dough hook and knead the dough for 6 minutes on low speed, until the dough is smooth and slightly sticky. Alternatively, you can knead the dough by hand for about 8 minutes. Place the dough in a lightly oiled bowl and cover it with plastic wrap. Let the dough rise in a warm spot (like a barely warm oven) until it doubles, about 2 hours. While the dough rises, make the filling; chill it until you're ready to use it. To form the buns: Transfer the dough from the bowl to a well-floured counter top or work surface, sprinkle the dough with a little more flour, and pat it down into a rough rectangular shape. With a rolling pin, roll the dough out to a 12x16-inch rectangle. Spread the filling out evenly over the dough to within 1/2" of the edges of the dough. Starting at the short end (or the long end if it's 6 am and you're still half asleep like I was), roll the dough tightly up into a log. With a serrated knife, cut the dough into twelve 1-inch rolls (or 1 1/2-inch rolls if you rolled it from the long end). Line the bottom of two 9-inch round cake pans or a 13x9-inch baking dish with parchment paper and lightly grease the paper with baking spray. Arrange 6 buns evenly spaced apart in each pan or all 12 in the large dish. Melt the additional tablespoon of butter and brush the tops of the buns with it. Cover the pans with plastic wrap and let the buns rise in a warm place until the buns just about double in size, 1 1/2 to 2 hours. When the buns have almost doubled, preheat the oven to 350° F.
Bake for 20-25 minutes (remove the plastic wrap first) until the buns are golden brown and the cheese is bubbling up. Serve immediately. The buns will keep, covered, at room temperature for 2-3 days. Reheat any leftovers (ha!) in a 250° F wrapped in foil until they are just warmed through. Switch to the dough hook and knead the dough for 6 minutes on low speed, until the dough is smooth and slightly sticky. Alternatively, you can knead the dough by hand for about 8 minutes. Place the dough in a lightly oiled bowl and cover it with plastic wrap. Let the dough rise in a warm spot (like a barely warm oven) until it doubles, about 2 hours. While the dough rises, make the filling; chill it until you’re ready to use it. To form the buns: Transfer the dough from the bowl to a well-floured counter top or work surface, sprinkle the dough with a little more flour, and pat it down into a rough rectangular shape. With a rolling pin, roll the dough out to a 12×16-inch rectangle. Spread the filling out evenly over the dough to within 1/2″ of the edges of the dough. Starting at the short end (or the long end if it’s 6 am and you’re still half asleep like I was), roll the dough tightly up into a log. With a serrated knife, cut the dough into twelve 1-inch rolls (or 1 ½-inch rolls if you rolled it from the long end). Line the bottom of two 9-inch round cake pans or a 13×9-inch baking dish with parchment paper and lightly grease the paper with baking spray. Arrange 6 buns evenly spaced apart in each pan or all 12 in the large dish. Melt the additional tablespoon of butter and brush the tops of the buns with it. Cover the pans with plastic wrap and let the buns rise in a warm place until the buns just about double in size, 1 ½ to 2 hours. When the buns have almost doubled, preheat the oven to 350° F.
Bake for 20-25 minutes (remove the plastic wrap first) until the buns are golden brown and the cheese is bubbling up. Serve immediately. The buns will keep, covered, at room temperature for 2-3 days. Reheat any leftovers (ha!) in a 250° F oven wrapped in foil until they are just warmed through. Note: Give yourself some time to make this recipe; the inactive time for proofing is up to 4 hours total. Are they totally worth the wait? Absolutely. Is it feasible to start them in the morning to serve for breakfast? Likely not. But you can prep the dough up to the first rise and keep it in the fridge for up to 3 days before proceeding with the recipe. It’s a great time saver that I’ll definitely take advantage of for party prep or weekend guests. These are genius – the filling sounds aammmaazing. yum! Ooooh these look mouthwatering. I’m getting hungry just looking at these photos! These sound incredible! I may have to add these to our Thanksgiving menu! I want one – or five – of these… like right now. They were already near the top of my to-make list, and now they are the top of the list. Yep, restraint is a serious thing with these buns. I know you guys will love them! These look absolutely awesome! Great idea! 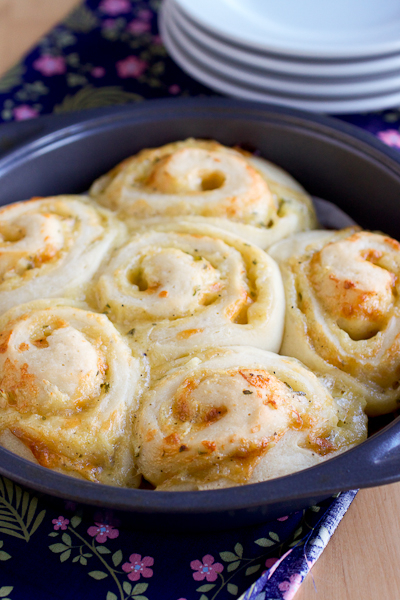 Cheesy cinnamon rolls…an awesome idea! These look so tasty! Love savory twists on usually sweet dishes. 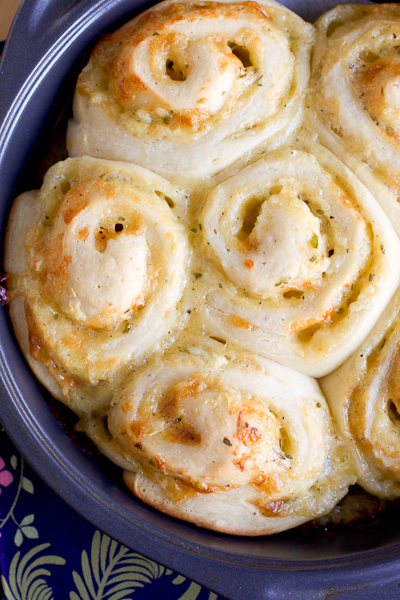 These remind us of our favorite cheese bagels. Definitely making them ASAP!!! 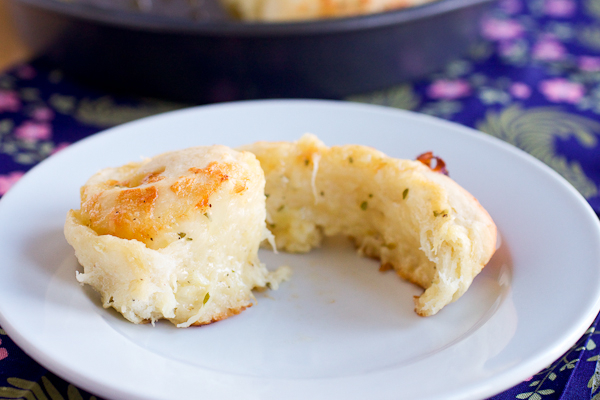 Bread and cheese–how could these not be fantastic? Best of luck with the housewarming!